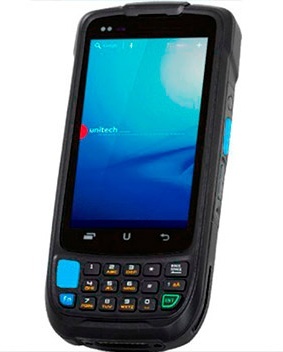 The Unitech EA300 (Android 5.1) is a rugged 4.0” mobile enterprise computer combining wireless communication and performance to provide powerful data collection. The EA300 offers a host of data collection options to enhance the service level for a variety of vertical applications such as retail, inventory management, asset tracking, light warehousing. Combining touch screen and keypad. The 4” EA300 features a keypad, 2D imager, 4G LTE, Dual-band WiFi and comes standard with charging cradle. The EA300 is designed with “intensive data entry a data collection” in mind. This device has a 4” TFT-LCD HD touch screen and features an integrated 17-key keypad (incl. alpha/numeric, scan keys and special characters) as well as dual scanning buttons (left and right side) for convenient barcode capturing. In addition the EA300 offers an integrated 1D and 2D imager, GPS, 5.0 MP camera, HF/NFC RFID reader/writer to complete your data collection requirements. This device offers everything you’ll need. Android 5.1 operating system, making this device suitable for data-intensive applications in highly mobile environments. Mobile workers can easily accelerate their workflow as this device is equipped with a 2GB RAM, 16GB ROM and supports an additional microSD expansion (up to 32GB storage capacity). Holding a 3800mAh removable battery the EA300 provides continuous usage time without needing to worry about running out of juice. Enjoy the fastest data speeds out there with the integrated Bluetooth 4.0, Dual-band 802.11 a/b/g/n WiFi and 4G LTE connectivity. This device is truly an excellent mobility device and offers job improvement and efficiency at a competitive price! • All-in-one box; EA300 comes with USB cradle and power supply. • All-in-one function: Keypad, 1D & 2D barcode Imager, RFID HF/NFC and 8MP Camera. • Suitable for any mobile worker: 4G / LTE, Dual-Band 802.11 a/b/g/n WiFi, GPS and Bluetooth 4.0 HS slow energy. • Rechargeable and swappable 3800mAh battery. • 4” HD display touch screen and 17-key keypad. • Rugged: Gorilla Glass 3, IP65 rated and 1.5m drop specification. • Dual Scanning Buttons (left and right side) and scanning button on keypad. • Device supported versatile: SOTI, 12Manage. • Optional additional UnitCare 2.0 coverage available. high-quality and effective program for getting your devices serviced quickly. It also drives the hidden costs out of your installations. UnitCare goes beyond the standard warranty with a complete service offer for different need.